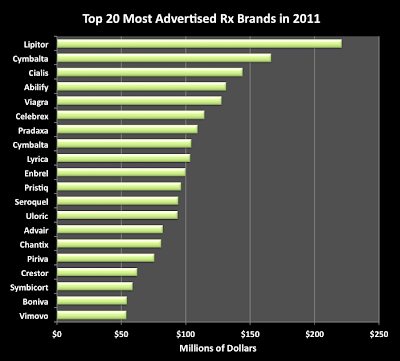 Another TOP 20 advertised Pfizer drug is ENBREL. 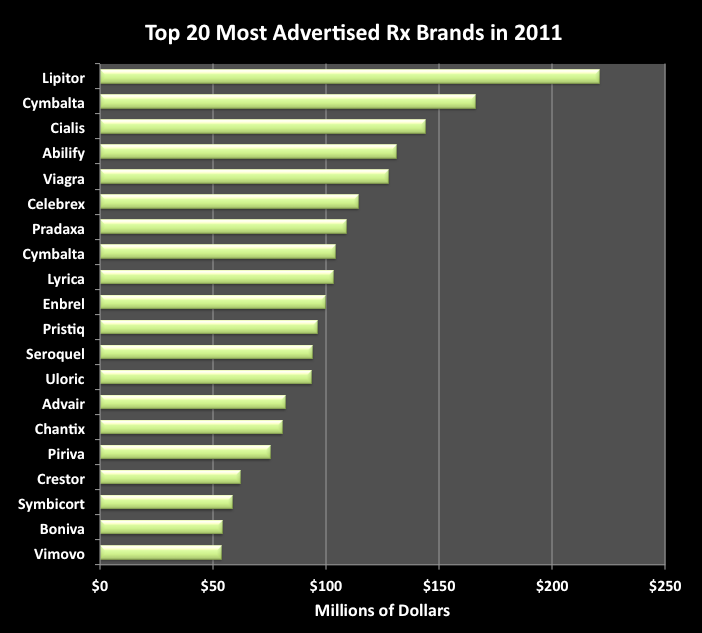 Pfizer & Amgen spent nearly $100 million on Enbrel DTC advertising in 2011 (compared to $71 million in 2010). And this number does NOT include what the Amgen/Pfizer has paid Phil Mickelson to be the Enbrel celebrity spokesperson (see "Amgen Blows Its Marketing Budget on Phil Mickelson Campaign" for more on that). On TV, Mickelson promotes Enbrel for the treatment of his psoriatic arthritis. According to the MM&M article cited above, psoriatic arthritis afflicts "around one in 20 of the 2% of Americans who suffer from psoriasis." That works out to be 375,000 people (1 in 20 of 7.5 million). Approximately 63 cents out of every DTC ad dollar goes to TV. 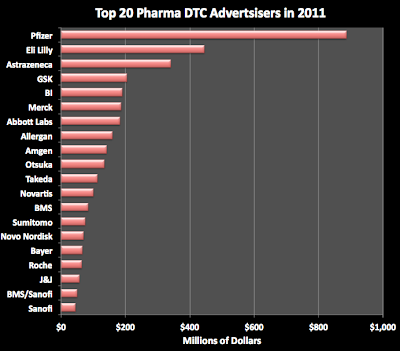 So, Pfizer/Amgen spend about $63 million to reach 375,000 people via TV ads! 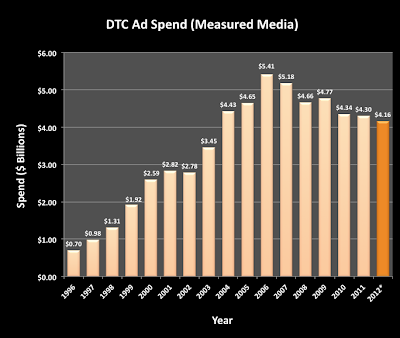 It seems a bit exorbitant to spend so much for broadcasting versus a more targeted approach. 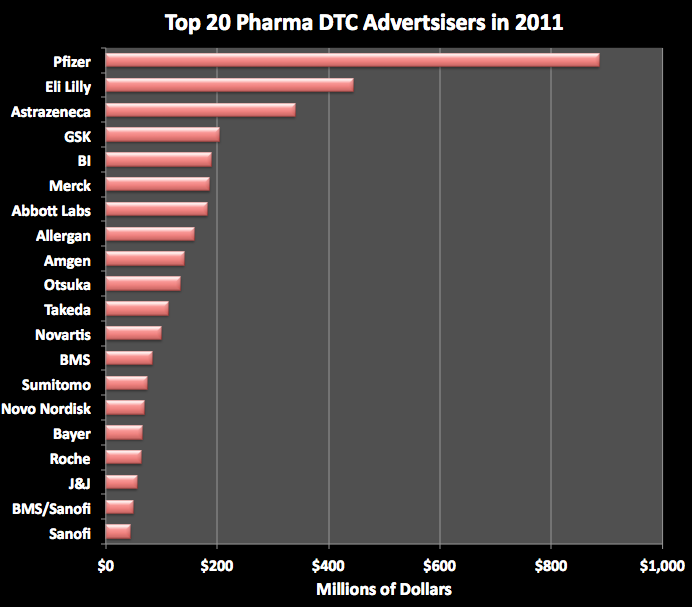 Anyway, that's the crazy world of Pharma DTC advertising! Go figure.